The big shift to mobile advertising. It’s not all careening downhill, at least not for everyone – or at least not for the biggest two: Google and Facebook. More on our two heroes in a moment. 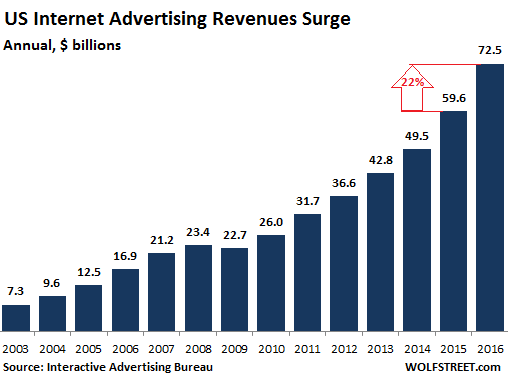 Internet advertising revenues in the US soared 22% in 2016 from a year earlier to a record of $72.5 billion, surpassing for the first time in history the $69 billion spent on TV ads. Mobile advertising, a subcategory of internet advertising that covers smartphones and tablets, soared 77% in 2016 to $36.6 billion. For the first time in history, mobile advertising accounted for more than half (50.4%) of total internet advertising, according to the new report by the Interactive Advertising Bureau (IAB). Social media advertising soared 49% to $16.3 billion, thanks to the surge of social media ads on mobile. Search ads overall – desktop and mobile combined – rose 19% to $35 billion, accounting for 48% of the total in 2016. But desktop search by itself is not doing well: the desktop share of total ad revenues fell to 24% in 2016, from 34% in 2015. And revenues fell 13% to $17.8 billion. 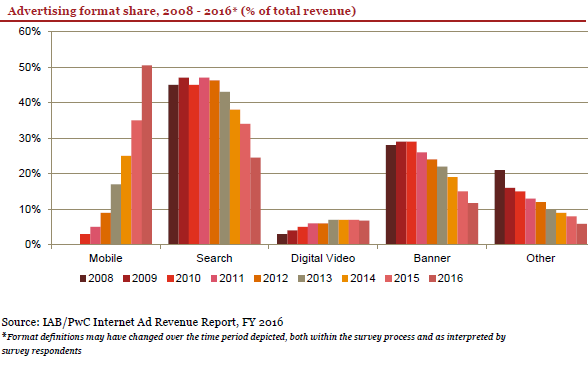 Display ads (banners and videos) – desktop and mobile combined – soared 44% to $31.7 billion. But desktop display ads alone fell 1% to $13.6 billion. The 10 leading ad-selling companies accounted for 73% of total revenues in Q4 2016, according to the report. So who are these 10 companies that grab the largest share of these revenues? The report didn’t say. But analysts for the Pivotal Research Group, cited by Reuters, reported the only two names that really matter: Facebook and Google. In terms of the industry growth, so in terms of the 22% or $12.9 billion year-over-year increase in total internet advertising revenue, Facebook and Google together grabbed 99% of the growth! They’re sitting at the sweet spot. Everyone else is fighting for crumbs. This explains some aspects of the Twitter fiasco. Behind its dazzling homemade metrics, Twitter reported today an ugly reality: Global revenues in the first quarter dropped 8% to $548 million, the first ever year-over-year decline. And advertising revenues in the US, the core of its business model – yes, internet advertising, including mobile where Twitter is big – plunged 17%.